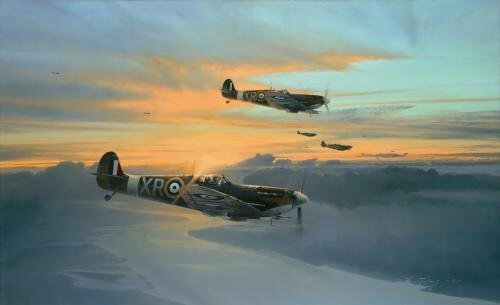 THE LIMITED EDITION Every print in this new Commemorative Limited Edition by Robert Taylor, has been signed by THREE highly respected American fighter pilots who, when Britain stood alone in Europe, volunteered to fly with the RAF to fight the monstrous tyranny of Hitler's Germany. THE EAGLE EDITION Issued with a matching-numbered companion pencil print by Robert Taylor and signed by an additional seven pilots, making a total of TEN signatures in this edition. THE EAGLE TRIBUTE PROOFS Released with all the components of the Eagle Edition, these Tribute Proofs have been signed by several additional Eagle Squadron pilots. A companion print, matted with museum quality replica RAF fighter wings, includes the signatures of three of the Eagles most famous names. There are a total of SIXTEEN signatures for collectors with the Tribute Proofs.